Marijuana is “the most common illicit drug used in the United States” (NIDA). Because of marijuana’s relatively low addictiveness and availability, many people do not consider the health effects of marijuana use. Just like any other drug, marijuana can cause health problems for those who use it. Marijuana can be smoked, mixed into food, or brewed as a tea. According to the NIDA, however marijuana is ingested, it “overactivates the endocannabinoid system, causing the ‘high’ and other effects that users experience,” like problems with coordination, problem solving, and learning. However, this is not just isolated to when the person is using the drug. Marijuana can affect the development of a young person’s brain if it is used enough. It causes problems with memory, cognitive processes, and development in the mind that “may last a long time or even be permanent.” Adults who have smoked a considerable amount of marijuana as adolescents do not experience the same ability of brain functions as those who have not, even if they quit later in life. 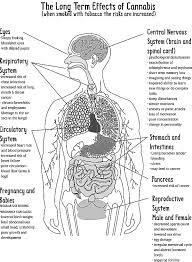 Marijuana use impacts various parts of the body. The ONDCP mentions a study which found that “people who smoke marijuana frequently but do not smoke tobacco have more health problems, including respiratory illness, than nonsmokers.” Although there is no conclusive evidence that smoking marijuana causes lung cancer, it can cause a host of other lung problems. Also according to the ONDCP, marijuana users have been found to have “a nearly five-fold increase in the risk of heart attack in the first hour after smoking the drug.” This is especially troubling for those who smoke often. Smoking or ingesting marijuana causes the heart rate to rise by 20 to 100 percent soon after the person has smoked which can linger for three hours afterward (NIDA). Marijuana also has been seen to have effects on the immune system through studies that were conducted on animals. As stated by the USDHH, these studies have found that THC (the active chemical in in Cannabis sativa or marijuana) “can damage the cells and tissues in the body that help protect [them] from disease.” This means that a person might become sick more often if he or she is smoking marijuana chronically. Marijuana is not altogether harmless and can cause many health risks, especially for those who start when they are young and use it chronically.